Lower Denture Problems. Can DenSureFit Help? That lower denture. That pesky lower that simply floats on my gum line and just never wants to behave and stay down. It pops up. I glue it in. That lasts for a little while, but after a bit, especially if I try to drink coffee, the adhesive starts dissolving. My denture starts popping up, again. The adhesive oozes and drips down my throat. What is the best way to get lower dentures to stay in place? Can DenSureFit help? Before we discuss the challenges of the lower denture, we must first understand how the upper works and why it stays in place better than the lower. The upper denture uses suction to stay in place. The suction occurs in the roof of your mouth (palate), particularly in the highest, most rounded place up there. This spot provides a constant, non-changing reference point where you can press your denture into and get suction. We call it your “suction spot”. When your gums fill the trough of your denture, your denture stays supported up in your suction spot; but when your gums shrink, they no longer fill the trough and you have voids or too much space there. Your denture is no longer supported in your suction spot…and it falls down. DenSureFit does a fantastic job of filling those voids in the trough so that your upper stays supported up in your suction spot. How? As you press your denture firmly up into your suction spot, the DenSureFit silicone spreads in its most fluid state and is forced into the voids in the trough that are causing your dentures to be loose. The silicone cures in the voids, makes a new impression, and adheres to the denture…all in 4 minutes! Now, your gums are properly supported because the trough of your denture is filled so, your denture stays up in our suction spot. Getting a snug fit with DenSureFit on the upper is fairly straight-forward and predictable. This is why we indicate that DenSureFit is for the upper denture. The success rate is far greater on the upper than the lower. It is the lack of a palate that causes the lower to be so challenging. You have no suction spot; no starting reference point. Your denture just hangs out there, floating on top of your gum line. Your tongue muscles constantly pop it up as we speak and eat. And, since saliva is produced there, it’s prime real estate for dissolving adhesive. This means that the one thing that might help it keep down, (adhesives) might not last very long before re-applications are necessary. Also, you must deal with the shrinking of our gums…your worst enemy. The roots of your teeth are no longer inside of your gum line for it to hold its shape. Therefore, your tissue shrinks. The bone gets smaller. Eventually, you’re left with very little surface area for your denture to hang on to, no matter what products you use. At this point, usually, not even dentists can make the denture stay put…no matter if they apply a soft reline or make a whole new denture. This is usually when your dentist recommends lower denture implants and informs you of the costs, which for many, is simply out of the question. One more factor to consider is that many lower dentures are, unfortunately, made or are improperly hard relined without adequate stabilization at the base of the back of the denture. Dr. Brent Kandarian of Glacier Denture Center and inventor of a lower denture stabilizer, explains this situation here and shows pictures of types of lower dentures: https://stabildent.com/denture-reline/. Can DenSureFit help my lower denture fit better? Maybe. It depends on your specific situation. It will likely not solve all your issues, but it can probably help make them better. Many dentists use this same reline material on lowers, so it is not the material used that is in question. The main factor that will help you determine if DenSureFit will help your lower fit better depends on the shape and height of your gum line. Do you have decent height on your lower ridge? If you have minor to medium looseness, and if your gum line is decent height without a lot of bone loss and tissue retraction, DenSureFit is likely to help your denture fit better… maybe not perfectly, but much better. The silicone does a fantastic job of filling the voids in your loose lower denture. It provides cushioning and a nice seal to keep food out. And it makes your denture more stable. If you have a decent height to your ridge, but your denture is just way too big because your gums have shrunk a lot, be aware that the more space you have to fill, the more challenging it is to get a good fit. What ridge? Mine is almost gone! People with low/shallow lower ridges are not good candidates for using DenSureFit. If your denture does not stay in place because you hardly have any ridge left, unfortunately, DenSureFit will likely not benefit you much. There is too little surface area on your gum line for the denture to hang onto. If your gums are shallow/low and your denture is a little loose, you can apply the DenSureFit and make it fit better, but the DenSureFit will not keep your denture from floating around. It can, however, provide a better surface for powder adhesive to adhere to, because your nooks and crannies are filled with silicone instead of adhesive. You end up having better surface contact of the adhesive on the gum line when voids are filled in with the silicone. What can DenSureFit do on the lower denture? What can’t DenSureFit do on the lower denture? Will I still have to use adhesive with my DenSureFit? Some people are able to go totally adhesive-free with the use of DenSureFit in their lower denture. Some will still need the assistance of adhesive on top of their silicone liner. What is the best denture adhesive for lower dentures relined with DenSureFit? Because DenSureFit silicone fills in the voids, we no longer have to try to fill in voids with paste adhesive. This means that we can switch to using powder adhesive instead of paste, which is a great improvement because the powder is generally much easier to clean off of the gums and denture at the end of the day, eliminating the tedious scraping off of the pastes. Plus, it doesn’t ooze like pastes. Should I try DenSureFit on my lower denture? 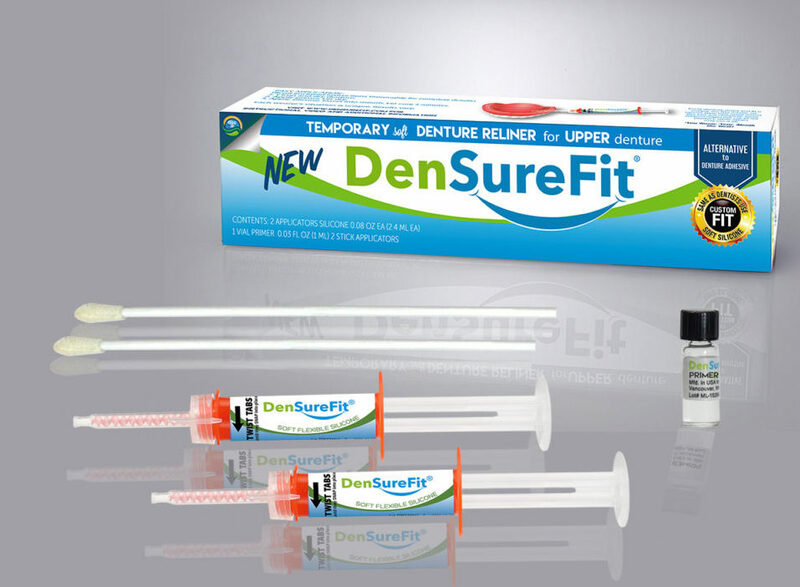 DenSureFit certainly helps many people with their lower dentures; however, we cannot guarantee that you will get a good result with DenSureFit or that it will solve all your lower denture problems. You should try to put yourself into one of the scenarios above that best reflects your situation to determine your chances of being helped by this product. Also, keep very realistic expectations about the results you might achieve. DenSureFit can help your lower fit better and be more comfortable and can help you get used to wearing your lower, but it cannot magically transform your gums, nor your denture. It can, however, make a difficult situation better. DenSureFit is easy to use, but it does require learning and even trial and error. Should you decide you’d like to try DenSureFit on your lower denture, please follow the procedure on our website. Click here for instructions. If you need help assessing your situation, please give DenSureFit a call at (844) 862-3368 or send us an email via our website or info@densurefit.com and we can discuss your situation with you. Getting Immediate Dentures and What to Expect: Can DenSureFit Help?